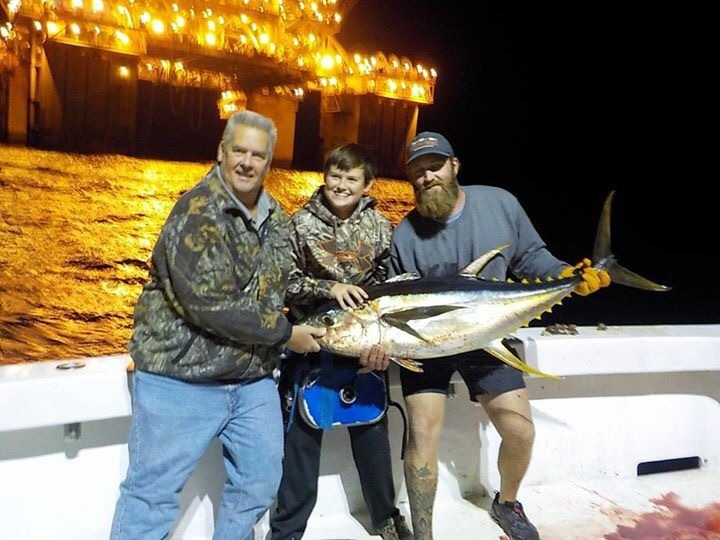 Intimidator Charters | We are a family owned and operated charter fishing business located in Orange Beach and Gulf Shores area of the Alabama Gulf Coast. We run half day, full day overnight and three day offshore fishing trips. We are a family owned and operated charter fishing business located in Orange Beach and Gulf Shores area of the Alabama Gulf Coast. We run half day, full day overnight and three day offshore fishing trips. Winter work is almost complete. We have beeb steadily working all winter long to continue completing our complete refit of the Intimidator. This Charter boat is only 18 years old, it has almost 40,000 hours on the main engines and we are absolutely committed to maintaining the standards that have allowed us to run so many trips for so many people for so long now. No way I can ever think all of the people who got me here and I’ll always be appreciative of each and everyone of you for giving me the opportunity to take you fishing. Furthermore, I can’t go fishing without great customers it’s impossible to build a repeat clientele without a truly dedicated staff of hard-working people. For over 20 years now I’ve had my buddy Reuben Ware work with me and that has been a godsend for both of us. While I still run the vast majority the fishing trips don’t be surprised if one day Reuben is here to give me a day off and runs the boat. It is absolutely vital and crucially important for us to remain rested and ready to go to make sure that we do not have bad attitudes and grumpy people in place when it’s time for your fishing trip. That’s a promise. Over the last two years we have replaced almost everything from all of the water tanks, two brand new generators, rebuilt engine beds, replaced the transmissions, straightened propeller shafted and put new propellers, new rudders with all new steering. This winter we have put new cushions throughout the boat along with new swimming pool pumps that provide cooling water for the air conditioners and the live well. I’ve spent more money in the last two years on maintenance than I did on my first charter boat. Fishing season is here. If you have waited too late to book a trip, the dates might be gone by now but call me and let’s talk it over. However, the charter boats without federal fishing permits (state guide boats) and all the private individuals who fish from their own personal boats are regulated differently and are looking at a 3 day a week season running Friday, Saturday and Sunday’s staying June 1 and will included the 4th of July. red snapper fishing is a huge boos to the local economy of Coastal Alabama especially of Orange Beach and Gulf Shores. As many of you know, I’ve been extremely active in the fishery management of the Gulf of Mexico for the last 15 years. I have personally worked extremely hard to help collect real-time data to help monitor and build a sustainable fishery for people to enjoy for generations to come. While this may seem burdensome to some people, there are individual’s that are truly in the charter fishing industry and make a living solely from charter fishing trips that will soon be able to see the benefits. I’m glad to see this go through and it will help us get more information to hopefully have a longer season in the near future. Of course, any new rule will have naysayers, but that’s not a news flash. Electronic reporting is not new. Fishery’s from the northeast to Alaska have been using this same technology for years and have never had any issue with losing spots to other people. They way it works is simple, about once an hour the unit will record a location, it doesn’t say if the boat is moving, fishing, anchored, at the dock, but what it will do is tell where that vessel was an hour ago which is a tremendous aid in an emergency situation. It also helped fishermen during the BP oil spill to show who was fishing and who was not. But one of the biggest things is it will show who is a licensed federally permitted vessel. At this time there is a tremendous number of captains who do not have a business license, marine insurance and maybe not even a captains license. It may seem that it is just keeping an honest guy honest, but it will help get guys without the proper credentials off the water. Here is an article published this morning by a news outlet. The unfortunate part of this is that this motion passed in the spring of 2017 and the people who show up at the meeting to voice any opposition are two years behind. The Pew Charitable Trusts is coming out in support of a program that would allow recreational fishermen to help reduce the mortality rates of some of the most popular stocks in the southeastern United States. In an article posted on its website, Pew’s Holly Binns and Leda Cunningham said fishermen seeking to catch and release reef fish, such as black sea bass and red snapper, inadvertently kill more than 10 percent of the stocks. That’s because fish that live in deeper waters cannot adequately handle the pressure changes as they’re pulled up from the sea. The difference in pressure can lead to fatal organ damage. That’s why they’re encouraging anglers to use descenders, a reusable device that anglers can attach to a fish that will regulate its internal organs until it gets back in its habitual waters. Proponents say the devices are easily affordable, starting out at around USD 50 (EUR 43.74). “Descending devices show strong promise in offering anglers a chance to help the fish populations they rely upon,” Binns and Cunningham wrote. The Pew column comes as members of the South Atlantic Fishery Management Council are considering creating a policy on their use. Members are expected to discuss the project at their March meeting in Jekyll Island, Georgia. Kim Iverson, the council’s public information officer, told SeafoodSource the SAFMC will review a draft amendment document and determine whether it is ready for a public hearing in the spring. However, Iverson noted that work on the document was delayed because of the five-week government shutdown and council members may opt to request more analysis before a hearing is set. The council will accept online comments from the general public before the meeting, she added. Last summer, the Gulf of Mexico Fishery Management Council implemented a new policy that highly encouraged recreational fishermen to use them on their trips. Emily Muehlstein, the Gulf council’s public information officer, said the council does not have any statistics yet on their use. “We are in the midst of developing a website to promote best fishing practices, and we’re planning to host a discard mortality workshop of scientists, managers, and anglers to (among other things) identify the data gaps and research priorities necessary to gauge the use and success of barotrauma mitigation behaviors in hopes of eventually informing stock assessments,” Muehlstein told SeafoodSource. Iverson said the South Atlantic FMC is aware of the Gulf council’s work. Currently, the South Atlantic’s plan is to create a formal regulation, but public comments will help guide the FMC toward its final action. “The council’s intent is to address fishermen’s concerns about fish that are released and do not survive,” Iverson said. The American Sportfishing Association also backs the increased usage of descenders. Mike Leonard, the association’s vice president, cited the success west coast fisheries have had with the devices, which has helped avoid closures and opened new areas for fishing. 2019 fishing season is here. We have been fishing a good bit this year as the norther part of the country has been gripped by the polar vortex. This spring we have done several half day trip for customers from Michigan and Wisconsin who say it cheaper to rent a place here than to buy heating oil up north. I have to admit, I’m glad I don’t know they are talking about. Moving on, we are booking trips at a fast pace this year than in years past which is amazing! I’m truly blessed and I appreciate each and every one of y’all. If you haven’t been then take the time now to come and join us on a trip! We will always appreciate the opportunity to take you fishing. The weather has finally started to cool off and maybe we will get some fall like weather conditions for a month or so before the winter arrives. We have had some really good 10-12 hour day trips this fall with some nice catches of beeliners, amberjacks and a few big wahoo! On The overnight and multi-day trips we have been managing a few tuna fish but the highlight this fall has been the big amberjack’s along with some very impressive scamp grouper catches. Season to reopen for triggerfish and amberjack on August 1. The closed seasons are January 1 through the end of February and June 1 through July 31. Continued fishing will depend on the level of landings. When landings reach or are expected to reach the recreational annual catch limit, the season will be closed until March 1, 2019. If a closure is necessary, NOAA Fisheries will publish a bulletin alerting fishermen of the date and time. The bag limit is one gray triggerfish per angler per day within the 20-reef fish aggregate bag limit. The size limit is 15 inches fork length. The fishing season was changed in 2017 to be August 1 through July 31. The recreational fixed closed seasons are November 1 through April 30 and June 1 through July 31. The bag limit is one greater amberjack per angler per day. The recreational minimum size limit is 34 inches fork length. Federally permitted for-hire captains and crew are prohibited from retaining bag limits of any gray triggerfish, greater amberjack, or other federally managed reef fish while under charter. Federally permitted for-hire reef fish vessels must comply with the more restrictive of federal or state reef fish regulations when fishing for reef fish in state waters. What’s in season and when during 2018Here are my best guesses for the 2018 fishing season. Nothing is locked in place yet except the opening of Red Snapper on June 1st. The others species should be official in a month or two after the states announce their state water seasons. The shallow water grouper complex reopens on April 1st and should stay open through the end of the year. Amberjack is also currently open from May 1st to 31st and then will close, with a reopening August 1 to October 31, 2018. On June 1 Red Snapper will open. The closure date has not been established yet but based on the two previous years it will be mid July. The gag is the only species that will remain closed due to harvest until June 1 and will be open through the end of the year. All offshore species such as Yellowfin, Blackfin Tuna, Dolphin, Wahoo, and Marlin are in season all year. On this offshore fishing trip, we had my buddy Travis with his family and friends. This was probably the best 3 day trip of the entire year. They caught a pile of yellow-fin tunas, a fat blue marlin and even a couple of big wahoos. However, I think the food was the biggest hit of the trip! I’m glad ya’ll enjoyed it! We were really lucky as we beat the really rough weather to the dock which never happens to us. Thanks again to Travis and all the guys for the opportunity! Thanks 2016, you’re the best. As the 2016 fishing season come to a close it will go down as one of the best we have ever had. For the most part we had calm seas and the offshore bite was nothing less than epic. We had a nice blend of old repeat customers as well as a lot of new guys offshore. This is one of the most rewarding things for me as it is always great to introduce someone to the thrill of offshore big game fishing. Lee was wanting his grandson to get hooked on fishing and that is just what happened! For the first time in a long time there was a very pronounced afternoon and evening tuna bite that was very dependable. We started off our overnight trips in March by noticing a few yellowfin tunas in close. Then, they kept coming and coming and coming! Not only did the fish keep showing up so did the deep water drill ships. I think at One time there was 6 drill ships with in our two day range and maybe as many as 12 with in our 3 day range. Enter your email address to subscribe to this blog and receive notifications of new fishing reports by email.